If you are concerned about ‘flower miles’, you can try to source your flowers from UK growers. You can get a wealth of flowers grown in the UK like narcissi, pinks, chrysanthemum, lisianthus, alstroemeria, delphinium, roses, sweet peas, foliage and freesia. They will be available during their natural growing season, which means there is more choice in the summer months than in winter. Ask your local florist for more details about which products they stock. Fairtrade goods ensure that each person along the line of producing the product has been treated fairly and received a good price for their services. The scheme operates in developing countries and helps tackle poverty through guaranteed trade and revenues. It does not mean organic product. Several companies now offer Fairtrade flowers, including Waitrose and Marks and Spencer and many online companies like Arena Flowers and Bunches Florapost. The most readily available products are roses, which are produced in farms worldwide. Although the roses are transported to the UK by air, they often arrive in the cargo hold of passenger planes. It is often more environmentally friendly to grow the flowers in natural conditions in developing nations and freight them to the UK than it is for flowers to be grown under glass in Europe using additional heating and lighting. If you are concerned about the effects of pollution, you can source organic flowers from Flowers & Plants Association members. Organic flowers are grown around the world according to the country of origin’s standards. Organic roses can be eaten if they are guaranteed to be chemical-free, so could make an interesting chocolate-dipped starter for your wedding feast! Growers are always looking to reduce chemical use. 100% organic flowers may take a little effort to find; but many flowers are grown in “green” ways without having an official organic label. For year-round quality and variety to satisfy every modern bride’s demands, your flowers will come from the flower centre of the world, Holland. The industry is huge in Holland, and growers worldwide send their products to Holland for sale. If your heart is set on a particular flower, you can guarantee Holland will have it. You will even be able to source out of season flowers. Most florists stock Dutch flowers because of their reliability and quality. From Holland you will find the most varied selection of flower types, so you can be sure to match the specific colour of the material you have chosen for your bridesmaid’s dresses! Use natural rose petals for a beautiful, 100% biodegradable alternative to confetti. Your local florist will be able to advise you on the origins of the flowers they stock. They will be more than happy to assist you in getting exactly what you want and working with your theme. 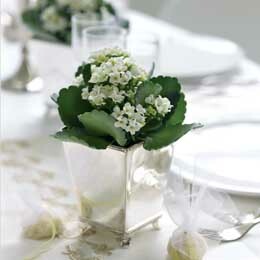 Tell your florist your concerns and they will be able to source the most appropriate items for you. They offer a bespoke service which ensures no two weddings are the same, to tailor make a bouquet and reception display as unique as you are. Did you know that growing cotton uses over a fifth of the world’s insecticides and a tenth of all pesticides, just for this one crop. So check out the labels in your outfits! Look for organic cotton or other natural fibres.